Oval Racing coming to SRS! NR2003 Series! 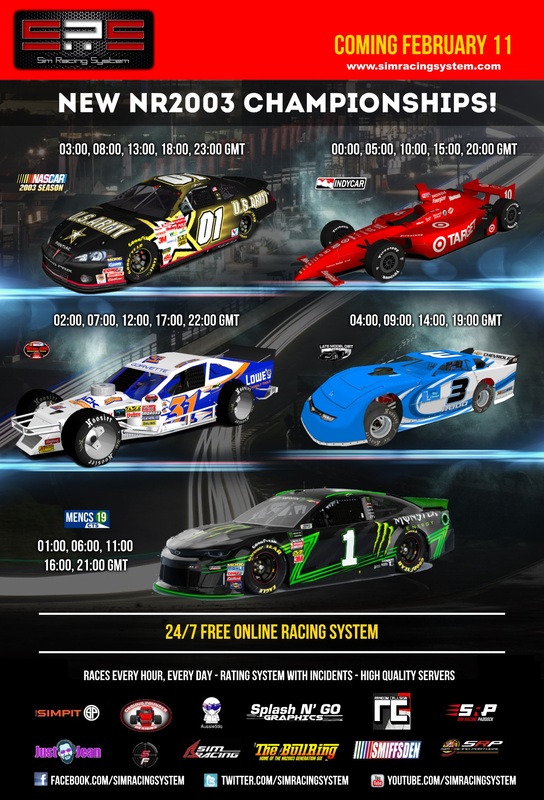 Sim Racing System Sim Racing System News Oval Racing coming to SRS! NR2003 Series! We are pleased to announce that from now on, SRS will feature Oval competitions! Despite it's age (16 years), Nascar Racing 2003 Season (NR2003) is still one of the most appreciated sims when it comes to oval racing. Mod teams have been producing quality content for 15 years and you can still find new mods being released such as the MENCUP 2019 by Splash N'Go who helped on the SRS APP tests. The app will be working as this announcement is made but everything should be reset on sunday in order to start the season on Monday at 00:00 GMT. Altough there was a testing period, please note that you may experience some unknown issues. If you do, please report it on the Apps' thread. The app features content detection & skin transfer, more info on the link bellow. This first season will feature 5 daily series. The series are already available on the 'Race', 'Daily Schedule' and 'Standings Page'. If you can't see them, go to your SRS profile > 'Aditional information' > 'Simulators' and select 'NR2003' on the sim list. Is there any place to buy and download it? (02-07-2019, 06:55 PM)Jannis Comfere Wrote: Is there any place to buy and download it? Yesssss!!!! Thank you for the effort! Much apreciate this!! Let's go turn left!! I mean the Game. Where I can buy it? You can find it on stores like Ebay, Amazon or similar. It's abandonware. If you want to get a boxed copy, you're looking at $200-$300. The game can legally be downloaded for free, which is partly the reason the community is still so active. Many thanks SRS! Been waiting for this day to come! Can't wait to start competing with the rest of the nr2003 community! And where is the "official" place to download it? I don't want to go to Softonic.